One of the oldest English sectors to survive, this instrument is dated before the publication of Thomas Hood's 1598 account of the instrument. Although lacking the sights which would equip it for surveying and other observational work, the instrument is evidently closely related to the first published pattern for the English sector. 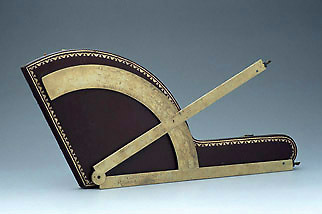 It would have been used chiefly with a pair of dividers as a geometrical device for proportions and graphical calculation.